This striking quilt was inspired by John’s visits to the Infinite Variety: Three Centuries of Red and White Quilts exhibit held in March, 2011 at The Armory in New York City. 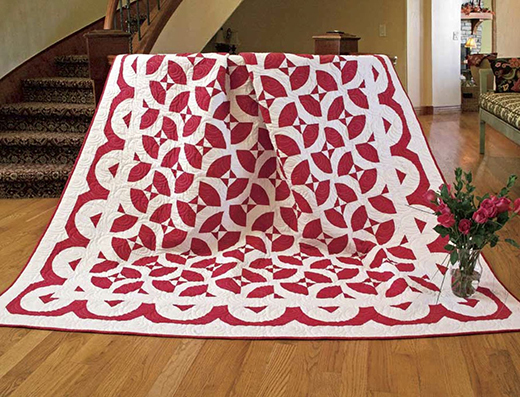 John used fabrics by Michael Miller (Cotton Couture Cranberry and Bright White) to duplicate the classic look of the exhibited quilts. The addition of corner triangles to the traditional Drunkard’s Path Block provides many exciting setting possibilities. Feel free to play with block arrangements before sewing rows for the quilt center.